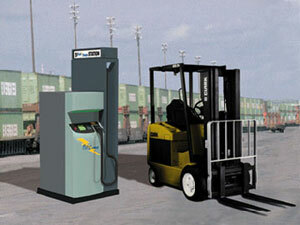 The Industrial PosiCharge is a fast charge system for electric lift trucks and airport ground support equipment. Fast charging increases efficiency in electric lift truck and ground support equipment operations. AeroVironment Inc., 222 E Huntington Drive, Monrovia, CA 91016. Tel: 626-357-9983; Fax: 626-359-9628.